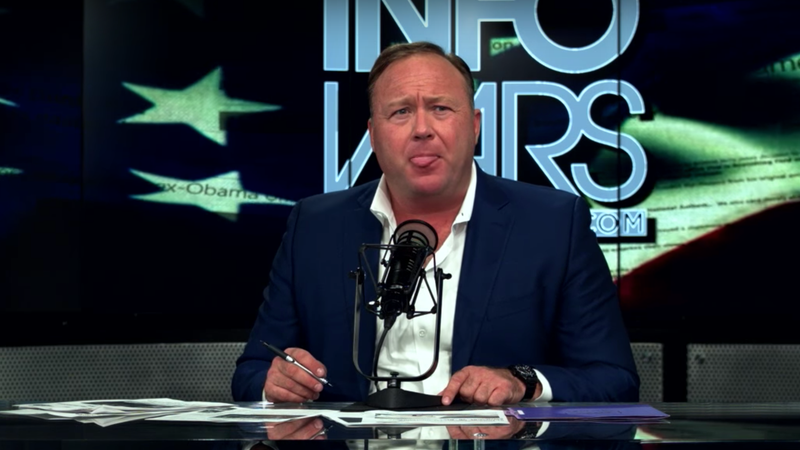 The InfoWars crew is facing yet another lawsuit, this time for alleged defamation over a blog published on the site that falsely implicated a Massachusetts man in the Valentine’s Day massacre at Marjory Stoneman Douglas High School in Parkland, Florida. The conspiracy site run by Alex Jones drums up millions of views by concocting wild theories around major terrorist attacks and mass shootings with generally no regard for the victims. The people InfoWars falsely implicates in crimes and cover-ups are often re-victimized, becoming targets of harassment and threats at the hands of his credulous followers. Jones, sued last month by a woman he accused of being a “CIA asset” for filming the vehicular attack at the neo-Nazi rally in Charlottesville, Virginia, last year, is now facing a lawsuit for over $1 million by Marcel Fontaine, a Massachusetts man whom InfoWars falsely identified as the suspected mass shooter at the Florida high school. On February 14th, InfoWars employee Kit Daniels—also named as a defendant in the lawsuit—published a blog titled, “Reported Florida Shooter Dressed as Communist, Supported ISIS.” The blog featured a photograph of Fontaine wearing a novelty red T-shirt depicting several prominent communist figures drinking and cutting loose (a “communist party,” get it?) including Karl Marx wearing a lampshade on his head. The InfoWars post at the center of Fontaine’s lawsuit has since been updated with a new headline that makes no mention of communism—“Reported Florida Shooter Discussed ‘Allahu Akbar’ on Instagram Profile”—and the photo of Fontaine has been removed. It contains neither an editor’s note nor a correction. The suspected shooter was later identified by authorities as Nikolas Jacob Cruz, a 19-year-old former student who had been expelled from Marjory Stoneman Douglas. Cruz was indicted by a grand jury on 17 counts of first-degree murder and 17 counts of attempted first-degree murder. During his March 14th arraignment, Cruz refused to enter a plea and the judge entered a “not guilty” plea for him on his behalf. The lawsuit, first reported by The Daily Beast, cites numerous instances of InfoWars propagating fake news. In April 2017, for instance, InfoWars accused the yogurt manufacturer Chobani of “importing migrant rapists,” which led to a lawsuit that Jones settled out of court in Chobani’s favor. It also cites the false Pizzagate theory, which Jones told listeners of his radio show to “go investigate for yourself.” An armed man later showed up at the Washington, DC, pizzeria at the center of the conspiracy plot and fired off several shots inside the business. In both of these instances (and several others) Jones was forced to issue an apology and denounce the conspiracy theories that both he and his website eagerly spread. The suit says as a result of the InfoWars post, Fontaine has suffered mental stress and anguish, disrupting his daily routine. Further, it says he suffers present and future damage to his reputation and image.